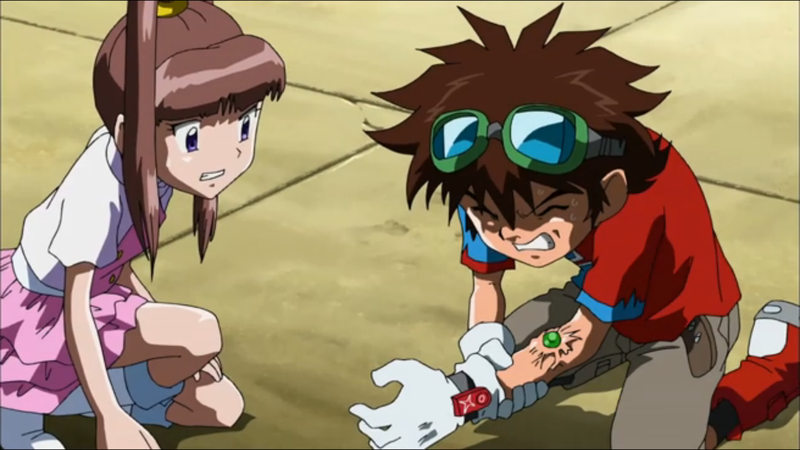 Digimon: System Restore: Fusion Episode 44: Regeneration Frustration! Even as Canyon Land hasn't executed its concepts perfectly, it deserves some credit for having the most ambition of any of the stories we've seen in this half of Fusion. With much of the drama gravitating towards the Digimon, it's the first time one of the generals has a proper breakdown. Mikey will get his test in the next land, but even that's more philosophical than traumatic. As faulty as Christopher's corruption and as flawed as Gravimon's tactics end up being, stunt here included, it's been a hell of a ride. This episode does well to make up for the issues of the last two, eschewing the easy Shoutmon X7 victory pounding for a climax that can still include the whole cast. The Shoutmon X7 victory pounding felt like the right way to end the last episode. Team's united, new evolution smashes all the bad guys, freeze on a shot of the three generals doing a mid-air high-five, roll the credits. It's how the first three Dark Generals went down, and we're accustomed to this two-episode-per-general clip. Not so, apparently, as none of the usual victory trumpets sound. Credit the team for realizing that something isn't right here and for doing the smart thing: they send Monitamon back on recon duty and find a secure location to regroup. And to treat that suspicious burn on Mikey's arm that he doesn't remember receiving. Usually when a bad guy is not quite dead, it's annoying. That's because it usually reeks of needing one more episode to burn or one more evolution to debut. Neither is the case here. Instead, Gravimon's regeneration mechanic is the puzzle we've been looking for, inviting cool elements like the hostage situation, the vault red herring, and more mind games for Christopher. In an appreciated touch of realism, the episode hasn't forgotten the previous Christopher angst. He's still rebooting, reconciling the horror of murdering Deckerdramon with having such forgiving friends. It's an important scene, one that shows the three generals actually bonding for the first time ever. While Christopher and the effort to get a chuckle out of him is the biggest takeaway to the scene, even little stuff like Nene correcting Mikey's figure of speech shows how they've grown to become friends, something which we couldn't say until now. It also proves that the emergence of Shoutmon X7 wasn't a fluke borne out of raw emotion. By this point, there's no debate about whether or not to go after the captive Monitamon. Instead, the focus is on the rescue mission itself, a three-pronged attack that really draws out the fun of this team. 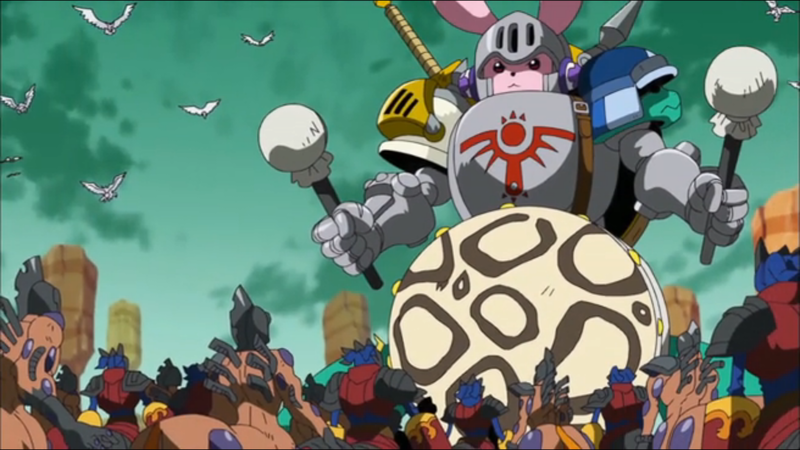 GreatestCutemon is the most imaginative digifuse we've seen in a while, getting Mikey's bench players involved while subduing Gravimon's massive army in a way that actually makes sense. Best of all, just when you wonder why fusions like this aren't seen more often, Cutemon shows why, running off in tears the first time he takes a hit. Nene rolls out another terrible costume to spring Anubismon's trap back at the castle, but she and Christopher were prepared for it and their non-X7 troops are just enough to handle it. The final step, killing Gravimon, proves impossible without first eliminating the horcrux he had implanted in Mikey. It's safe to assume that he knew Christopher was “too weak” to turn on Mikey a second time, and that he was just playing mind games again. It's almost funny that as much as he had Christopher nailed down, he completely misread Mikey's ability to be smart and reckless at the same time. Yes, it's another strategic mistake, but Gravimon didn't have a whole lot of time to plan that. And yes, ultimately Mikey steps up to steal the crucial moment in Christopher's character arc, but any move that turns into a psychological game of chicken has to go down as a winner. Dracomon tries convincing Christopher that Deckerdramon's death wasn't his fault. It's a sweet moment for the underused Digimon, totally wrong as he is. HiVisionMonitamon sneaks through the castle... hiding in a bush. Might need a return trip to Warrior Zone for a reminder about blending in with his surroundings. No wonder he was caught. What was the point of Gravimon and Shoutmon X7 setting the terms of their fight? Shoutmon X7 knew there was already a mission to rescue HiVisionMonitamon, plus the ultimate aim was killing Gravimon? What was the benefit to agreeing to capture if Gravimon won? For somebody that hasn't even warranted a mention yet, Cyberdramon's been awfully busy in Canyon Land. He was present and did something meaningful in all three episodes. Can we talk about how painful that core looked pulsating on Mikey's arm? The very idea of Gravimon's soul infecting Mikey's entire body is a bit cringe-worthy. It's really hard to tell how Mikey didn't get hit at the end there. It's implied that Mervamon intercepted the attack somehow, but it's not actually shown and unlikely that she would react after Mikey, but still with enough time to save him. It's pretty academic, but worth asking: what was Gravimon's best move? Duh, hit Nene instead. Nene's not as likely to do something that reckless and Christopher would be even less likely to kill her than his purported rival. "It's pretty academic, but worth asking: what was Gravimon's best move?" Actually, Gravimon's move was such a beautiful stalemate that the best move he could have made would have been to hold his nerve and let his core be destroyed along with Mikey. Granted, it kills him, but Gravimon can be revived by the Code Crown, which is currently in the hands of his side. Mikey cannot. But it's pretty impressive the anime goes this far to begin with, and it's cool the one thing that beats Gravimon is his sheer self-interest.